Today, the church seems to have forgotten about the spiritual discipline of fasting. Most of us have never heard a sermon about it, and few of us have ever practiced it. We think of fasting as an antiquated relic of the past. So why should we fast in an age of fast food? Pastor Daniel R. Hyde argues that "fasting is actually a basic biblical teaching and practice, one that is vital to cultivating godly living in an ungodly generation." Fasting is a means to the end of abiding, deep, and personal communion with the triune God through prayer. The author explains what fasting is, provides biblical examples of it, reminds us of what Jesus taught regarding it, and tells us how to go about it. Book jacket. 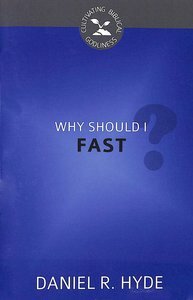 About "Why Should I Fast? (Cultivating Biblical Godliness Series)"